Literary References: works in which “The Passionate Shepherd to His Love” is referenced, quoted, and used. What makes “The Passionate Shepherd to His Love” as equally frustrating as it is interesting, is how unsure we are of the date it was written. While The Passionate Pilgrim was printed in 1599, Marlowe had already been dead for 6 years. The first reference to “The Passionate Shepherd to His Love” is in Marlowe’s own work, The Jew of Malta, believed to have been written in either 1589-90. At the end of Act IV Scene II, lines 91-101, Ithamore speaks to Bellamira (a courtesan): “Content, but we will leave this paltry land, / And sail from hence to Greece, to lovely Greece, / I’ll be thy Jason, thou my golden fleece; / […] Thou in those groves, by Dis above, / Shalt live with me, and be my love “(91-93, 100-101).2 Marlowe’s The Jew of Malta is not a tale of courtly love or romance, and the character of Ithamore is not a heroic figure who inspires sympathy from the reader. Later in William Shakespeare’s The Merry Wives of Windsor, written before 1597 and first performed in 1602, Sir Hugh Evens sings two fragments of Marlowe’s poem in the middle of Act III, Scene I: “[Sings] / To shallow rivers, to whose falls/Melodious birds sings madrigals. / There will we make our beds of roses / And a thousand fragrant posies. / To shallow-“(12-16).3 In this scene, feelings of melancholy are represented through both scripture and Marlowe’s love song. Another example to consider is a broadside ballad that Marlowe’s lyrics might have helped inspire. The quote below is from the 10th stanza of the ballad “Ile never Love thee more / being a true Love Song between a young / Man and a Maid” dated 1674-1679. Similar to the Marlowe/Raleigh broadside ballad, this ballad is a dialogue between a man and a woman, and as the title says, it is a song of true love. 1 Frith, William Powell. Merry Wives of Windsor. 1843. 2 Marlowe, Christopher, and Siemon, James R. The Jew of Malta. C Black, 1994. 3 Shakespeare, William, and David Crane. The Merry Wives of Windsor. Cambridge UP, 1997. 4 Walton, Izaak. Walton’s Complete Angler. 1653, 14-19. 5 Walton, Izaak. Walton’s Complete Angler. 1653, 14-19. 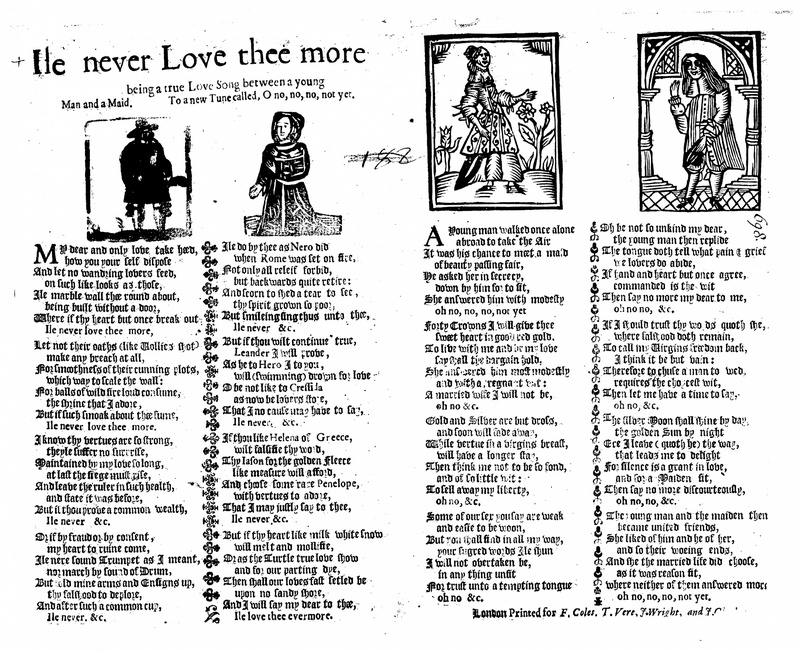 6 “Ile never Love thee more / being a true Love Song between a young / Man and a Maid,” Printed for F. Coles. T. Vere, J. Wright, and J. Clarke, 1674-1679, Magdalene College, Pepys 3.266, EBBA 21280. 7 Figure 1: Magdalene College, Pepys 3.266, EBBA 21280.